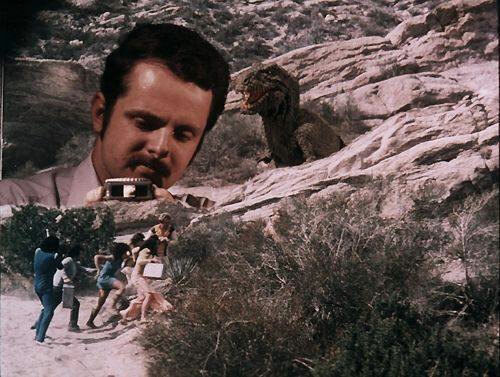 I'm very fond of the 1978 sci-fi film Planet Of Dinosaurs. Sure, it's cheap as hell and the script is banal and the performances by the subpar cast are marginal, at best. But it is one of the last, great stop-motion animation special effects movies, with tons of terrific FX sequences by Jim Aupperle, Doug Beswick and Stephen Czerkas (Aupperle & Czerkas had both worked on Flesh Gordon and would go directly from this production to create stop-motion sequences for Filmations' Jason Of Star Command, while Beswick went on to The Empire Strikes Back). Space: 1970 is proud to share this gallery of behind-the-scenes shots, courtesy of Mark Wolf, with the Star Kids Alliance and other Old School effects fans. 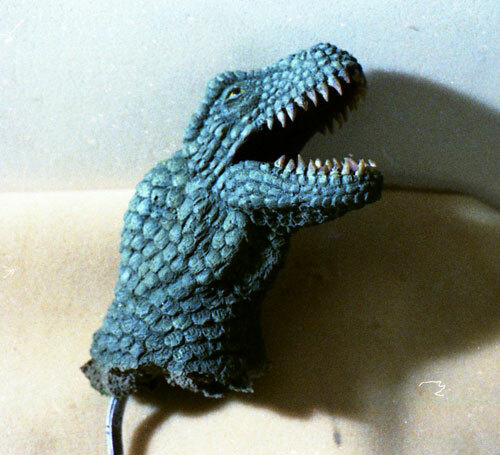 For my money, there's nothing like practical, handcrafted miniatures and animation models, brought to life by skillful artists and technicians "in camera." 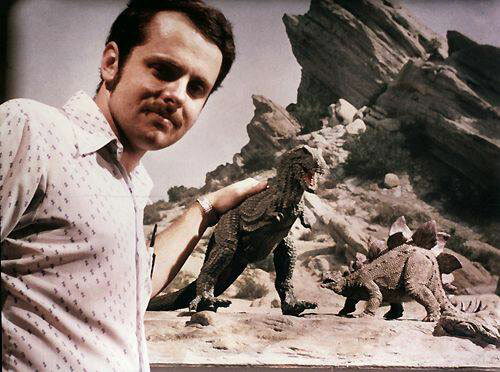 I'm not going to go off on a long-winded rant about today's "soulless CGI"... but no matter how spectacular and entertaining much of it is, consider this: I can't name a single computer effects creator I admire, while I can name several dozen practical effects artists whose work I can recognize on sight and enjoy over and over again. 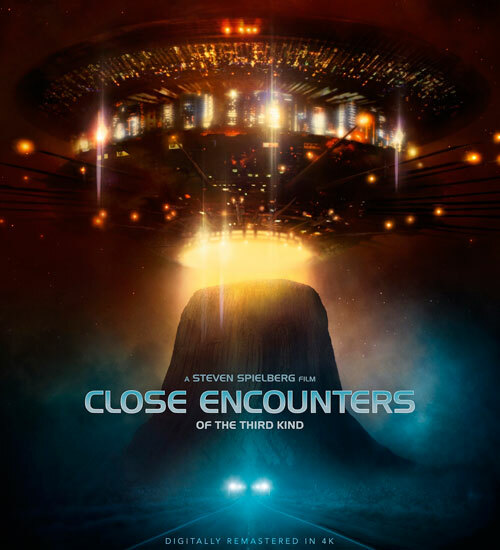 On September 1st, Sony/Columbia Pictures will be re-releasing Steven Spielberg's 1977 sci-fi classic, Close Encounters Of The Third Kind to theaters with a 4K remastered digital presentation. A couple weeks later, on September 19th, this version will be released on both HD Blu-ray and 4K UHD Blu-ray. Based on this official trailer, it looks as if virtually all of the film grain has now been digitally scrubbed from the movie, giving it a modern, digital video appearance. I have mixed feelings about this. 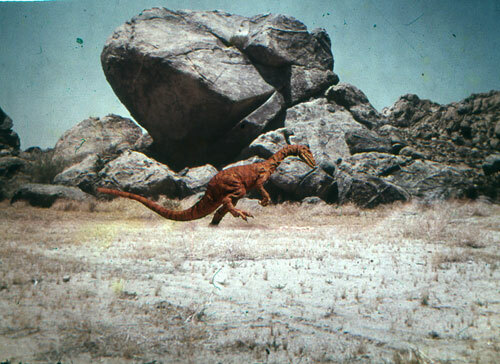 The 2007 Blu-ray was gorgeous, and had a truly "filmic" appearance, awash in glorious, vintage 1970's 35mm filmstock grain. The new transfer looks very sharp and clear, but just doesn't look like a Seventies movie anymore. I get that that's probably what Sony wants - they're trying to keep the property commercially viable - but it bugs me. I'm also annoyed by the fan response to this which is praising it for "cleaning up" the film. But that's where we are today, I'm afraid. 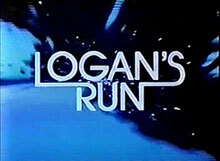 Courtesy of YouTube user "Greathall75," here is a nicely restored copy of MGM's nearly 8 minute-long advance featurette created to showcase the spectacle of their forthcoming sci-fi epic, Logan's Run. This rare promotional film premiered on January 13, 1976 at the MGM owners meeting, held at the MGM studio in Hollywood, California. 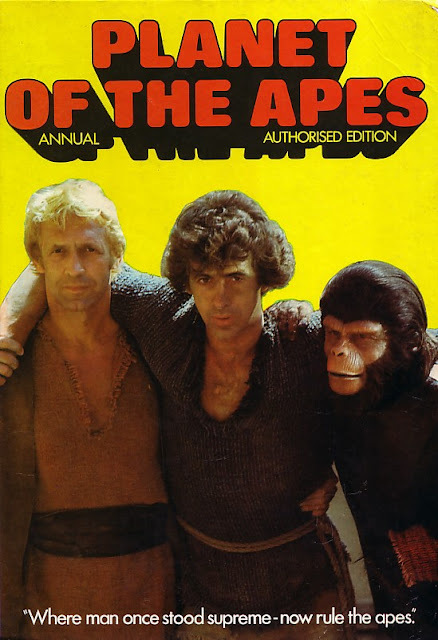 It was also shown to exhibitors at the National Association of Theater Owners convention in March of 1976. Since it was never inteneded to be seen by paying audiences, it includes a number of what would now be considered "spoilers." It also contains clips from deleted scenes, as well as alternate camera angles of familiar sequences from the film. The music is from Ice Station Zebra (1968) as Jerry Goldsmith had not yet finished recording the Logan's Run score. "I want to build a spaceship, go to the moon, salvage all the junk that's up there, bring it back and sell it." 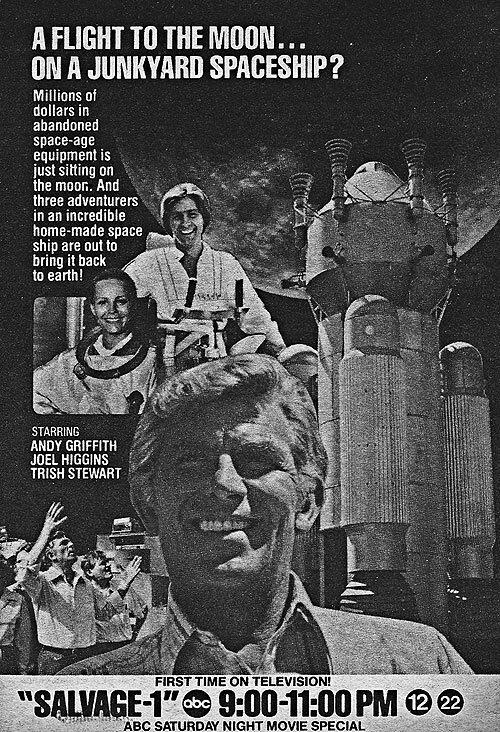 The TV movie, Salvage 1, starring Andy Griffith, Joel Higgins and Trish Stewart, debuted on ABC on January 20th, 1979. 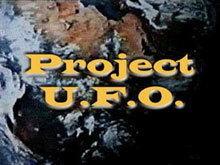 The telefilm, which chronicled a salvage expert's attempt to build a spaceship and travel to the moon (to salvage all the stuff NASA's Apollo astronauts left behind, as noted above), was a surprise ratings smash. The weekend it aired, I was staying at my cousins' house while my folks were on a snowmobiling excursion in Canada. 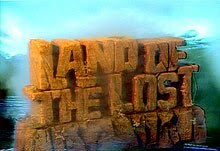 I vividly recall commandeering the TV set and forcing everyone to watch the movie, which I, as I remember, I found incredibly engrossing. The characters were likable, the junkyard spaceship - named The Vulture - was oddly believable and the actual trip to Luna seemed entirely possible (Isaac Asimov, according to his own autobiography, was a scientific advisor). I haven't seen it since, though, so I have no idea how it would play today. The ratings success of the telefilm led to a 20 episode (although only 13 were aired in its network run) Salvage 1 weekly series. I only saw a few of those, and I remember them being a real letdown, with mostly earthbound stories, and The Vulture being used only sparingly. As far as I can tell, just two of the episodes are available as Manufacture-On-Demand DVDs from Sony, and neither is the pilot film. 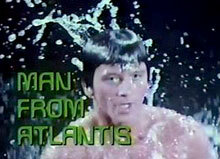 The titles available are "Golden Orbit" and "Hard Water," both of which originally aired as two-parters. 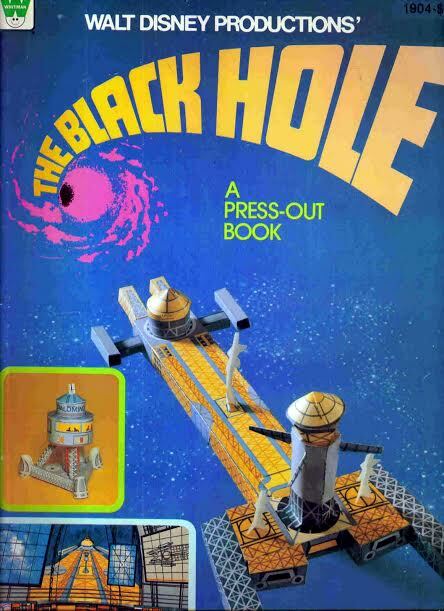 Here's a cool artifact of the 1970s, a Black Hole "Press-Out" Book, with fold-up paper spaceship models from Disney's 1979 outer space epic. The book was printed on a light cardstock, and you'd press-out perforated images of the various Black Hole ships like The Cygnus and The Palomino, and fold them into cool little replicas of the cinematic spacecraft. 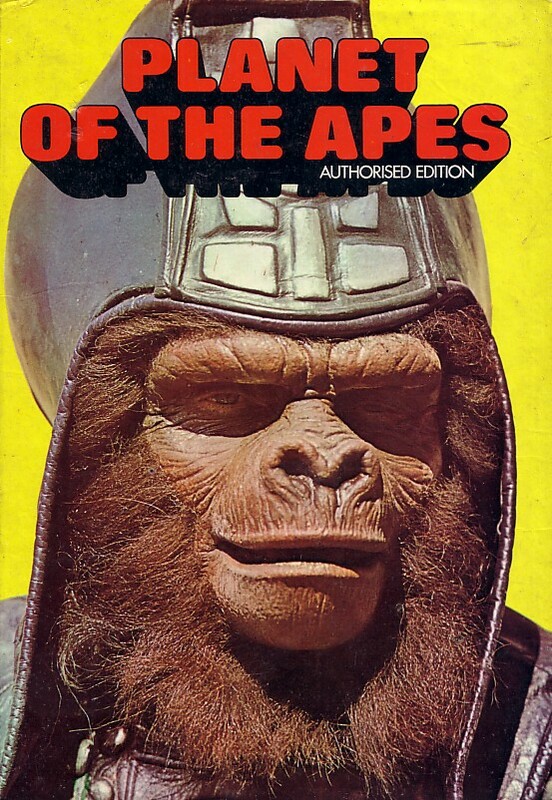 I kind of want this book now, though I doubt today's kids would find it much of a diversion. Not many people - adults or children - seem to build models anymore, of any kind. Why bother when everyone'll have a 3D printer soon, I guess? 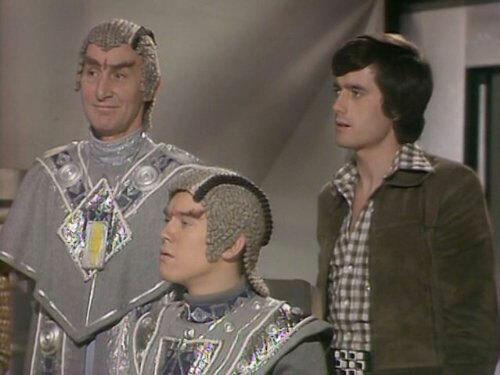 Guest Post: THE TOMORROW PEOPLE: "Into The Unknown"
Here's our first Guest Post on Space: 1970, from Star Kid Venger Satanis. I'm not personally familiar with The Tomorrow People at all - it aired in the UK from 1973 to 1979, and while it was syndicated in some U.S. markets (and on Nickelodeon in the 80s), it never played anywhere I could see it. 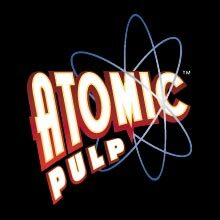 It dealt with the "next stage in human evolution," and centered on a group of young people with a range of mutant psionic powers. Sounds like the X-Men to me! It's been remade twice - in the 1990s, and most recently, for the CW in 2013. 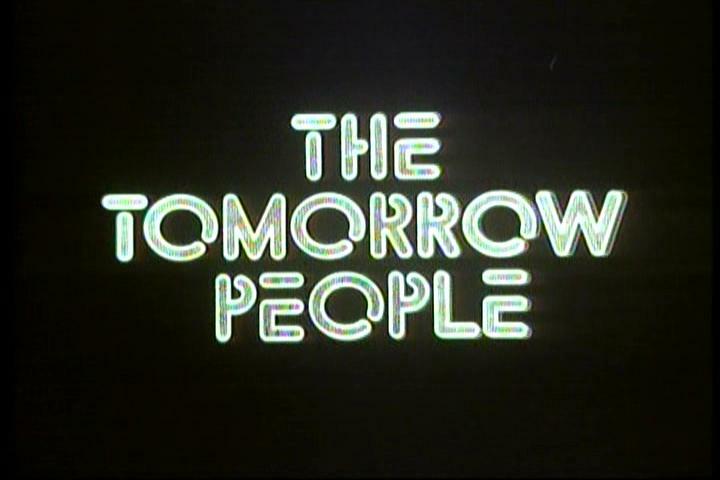 I used to watch the mid-seventies British TV show, The Tomorrow People when I was a kid. 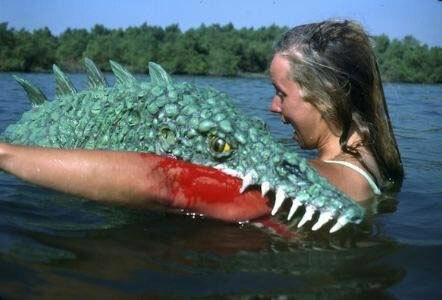 This was in the U.S. during the 80s. I remember seeing various episodes more than once, so Nickelodeon must have replayed the episodes over and over again. Lots of interesting sci-fi ideas and adventures that could only be fully appreciated by a 10 year old boy. Today, I'd like to write about one story in particular. I already looked on the internet and couldn't find more than one review of the four episodes comprising this tale, and the reviewer wasn't complimentary. He thought it was boring. However, what "Into the Unknown" lacks in action, it makes up for in cosmic horror. Not the kind of cosmic horror you'd find in that Space: 1999 episode with the Lovecraftian monster lurks at the center of that starship graveyard, but another kind. This cosmic horror is a slow and subtle dread. A haunted house in space that brushes its inhabitants up against the unknown. As Lovecraft stated, fear of the unknown is the greatest of all human fears. So, this Tomorrow People story is well named. Why is the title apt? There's a hole in space. It's black, but it's not a black hole. It's not really identified or identifiable at all, except for the aforementioned description. 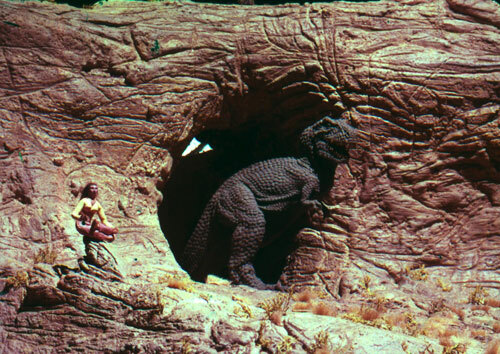 By the time the viewer reaches episode three, the main characters find themselves journeying through that space hole. It reminded me of the 1963 film The Haunting. Isolating, dark,unexplained, vulnerable... the characters are at the mercy of forces they don't understand. We, the audience, don't understand them either. The starless void is clearly not where human beings are supposed to be. It seems actively hostile - or ambivalent, at the very least - as the characters' ship travels onward. Little things like losing control, the ship speeding up or slowing down on its own, the darkness and then light. No one knows exactly what the Hell is going on. Such weirdness would be merely a novelty if the characters didn't have any agency. Thankfully, they do. In fact, they have to make a major decision that will affect the outcome. This decision point has to be made without much to go on, being in the midst of an alien phenomenon. The lack of clarity only makes it more terrifying. The characters can either trust their instincts or the supernatural, neither of which is particularly reassuring. And in the end, we never get a full account of what that hole in space was. Oh sure, there are subjective interpretations - a sort of circularity, perhaps - but nothing concrete, nothing official, nothing we can point to that will comfort our fear of the unknown. I won't spoil the thing by going through every detail with a fine-toothed comb, but wanted to give you enough information so you could judge whether to watch it for yourself. As a 10 year old boy, I was fascinated by this story's feeling of dread. 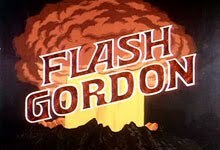 Re-watching it last week, the impression is nearly as strong as it was three decades ago; however, I can better appreciate what the writer was trying to convey. 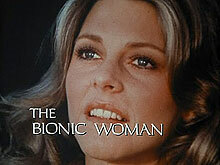 In 1975, he and Bain co-starred on the British science fiction series Space: 1999. His role as the intellectual commander of Moonbase Alpha, an artificial habitat on the surface of the wandering Moon, was iconic. After a career slump in the Eighties, the actor received acclaim and Oscar nods in the 90s, with his win for his portrayal of legendary horror star Bela Lugosi in Tim Burton's Ed Wood being especially notable. As this blog was on hiatus for the last few months, I didn't post notices of the passings of two other Space: 1970 icons (although I did note them on this site's Facebook page.) I want to correct that now. 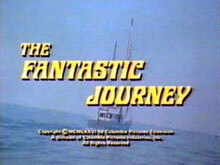 • On May 24th, Jared Martin, star of the 1977 sci-fi series, The Fantastic Journey, died at age 75. 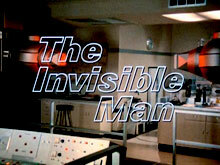 A prolific television actor, Martin not only portrayed the enigmatic, time traveling futurian Varian on Journey, but made guest appearances on The Incredible Hulk, Wonder Woman, Logan's Run and The Six Million Dollar Man. In the late Eighties, he starred as Dr. Harrison Blackwood on the War Of the Worlds television series for two seasons. I always liked Martin - he possessed an otherworldly quality that served him particularly well in genre roles. He will be missed. 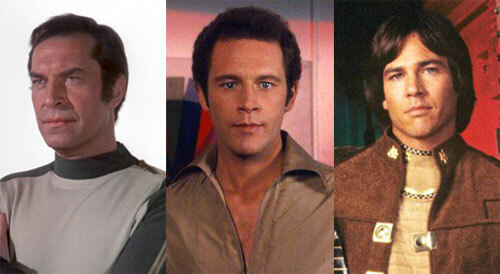 • Back in February, we lost Battlestar Galactica's original Captain Apollo, Richard Hatch. He passed away on February 7th, at the age of 71. As the heroic, responsible fighter pilot, Hatch's Apollo was a genuinely positive role model for 70s Star Kids, and his loss is heavily felt. His connection with the role and the show never faded; in the 90s he produced a "pilot film" for a proposed revival and co-authored several novels continuing the adventures of the Galactica and its multi-generational crew. When the series was finally rebooted in the early 2000's by the SyFy channel, Hatch joined the cast as Tom Zarek, and provided the voice of Apollo for the 2003 Galactica video game. Let's hope that I don't have to write any more obituaries this year. I remember seeing this newspaper ad "slick" in the pages of Starlog (Issue #10 or #11, I think), and it was my very first glimpse of the original Buck Rogers serial. 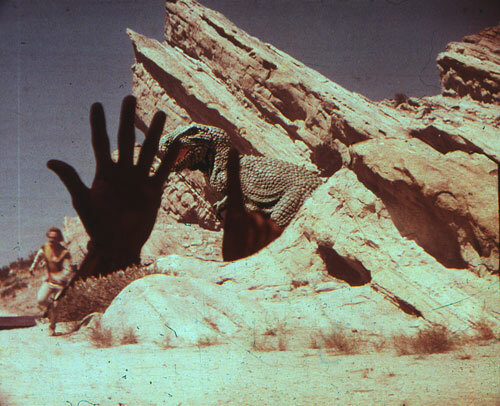 Riding both the Star Wars sci-fi juggernaut and the general wave of pop culture nostalgia prevalent in the 70s, opportunistic independent film distributor Crystal Pictures licensed the 1939 Universal Buck Rogers chapterplay starring Buster Crabbe and made it available to revival theaters and college campuses. 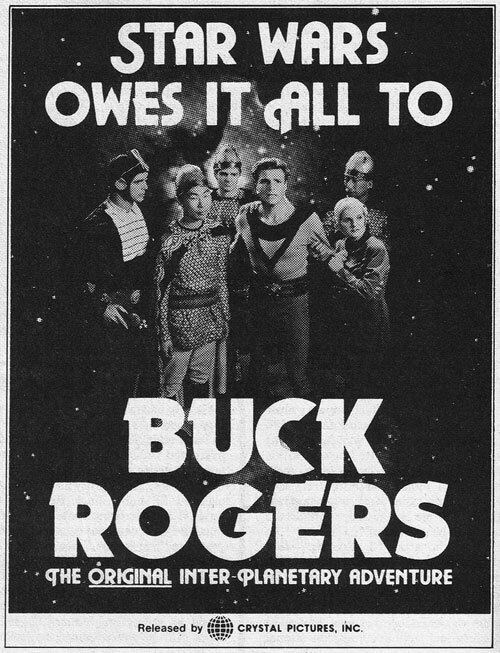 I have no idea how successful this theatrical campaign was, but within a year, Universal had begun work on their own Buck Rogers revival, which eventually led to the 1979 TV pilot/theatrical film and subsequent television series. 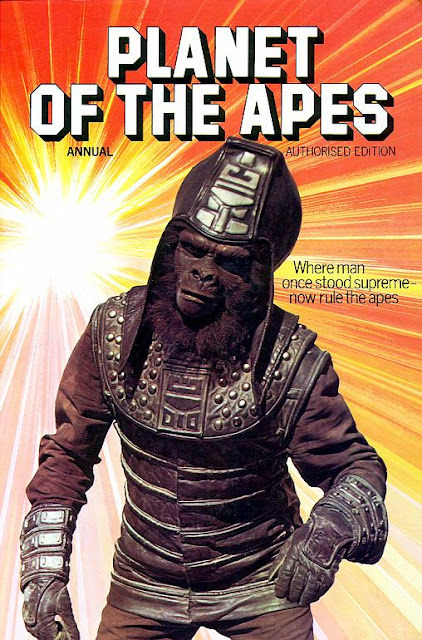 Here are the covers for the UK Planet Of The Apes Annuals, published by Brown & Watson between 1975 and 1977. As with all of these uniquely British publications, these were hardcover books aimed at children, containing articles, stories, comics and activities/puzzles. Having grown up in U.S., I never knew these publications existed until I was an adult and saw images of them on the Internet. 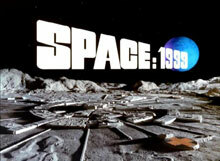 I now have a Space: 1999 annual and the Star Maidens one, both bought online a few years ago. I wish I'd had these as a kid - especially the ones that tied-in with short-lived genre shows like Man From Atlantis and Logan's Run. 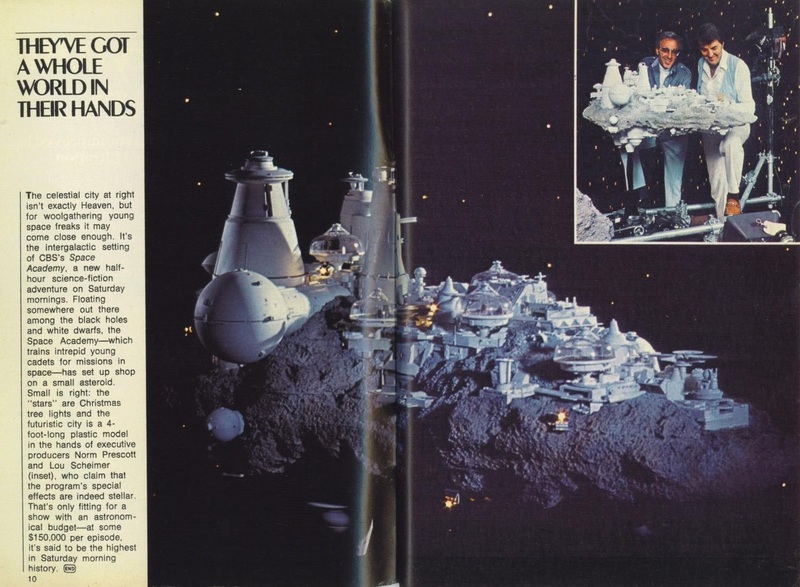 I have very distinct memories of seeing this TV Guide photo spread back in '77, showcasing the (still) impressive miniature location of Filmation's kidvid classic, Space Academy, and marveling at all the tiny details. 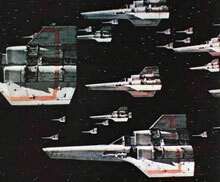 After the cancellation of the original Battlestar Galactica, Universal re-edited the episodes into two-hour movies and offered them to independent stations as a syndication package. At least one of these, the "Experiment In Terra" telefilm, included a prologue that showed American astronauts discovering the Battlestar Galactica's log book floating in space. Within it, Adama details the origins of the Cylon race as reptilians who were ultimately conquered by their own cybernetic creations. 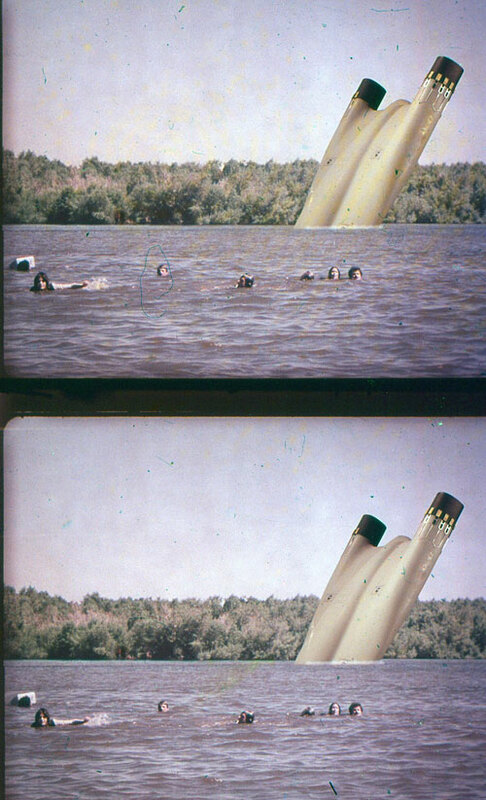 Since those telefilms were not released on home video, nor aired anywhere that I ever lived, I never saw this footage until today. Check it out! 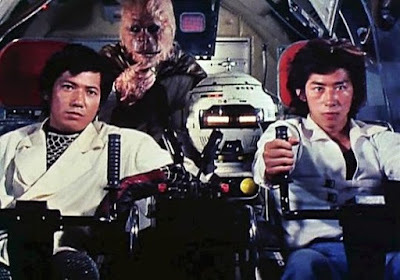 I haven't posted much about the Message From Space: Galaxy Wars television series, spun off from the Japanese feature of the same name, because until recently, I knew very little about it. 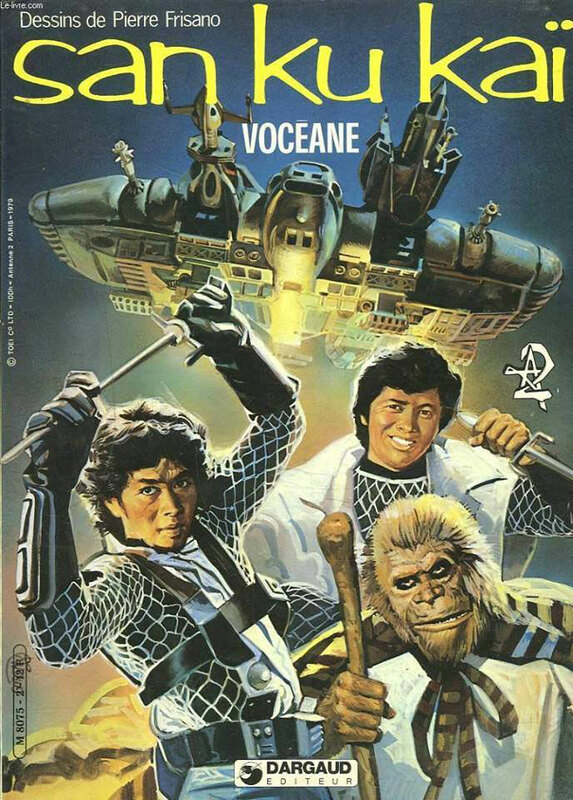 I still don't have a lot of information about the series, but I know it was popular in Europe (especially France), and in English-speaking markets it was known as Space Ninja! There was also a feature-length compilation/condensation, called Swords Of The Space Ark. I actually found and watched it on YouTube some months ago. It was fun, although it made little sense. 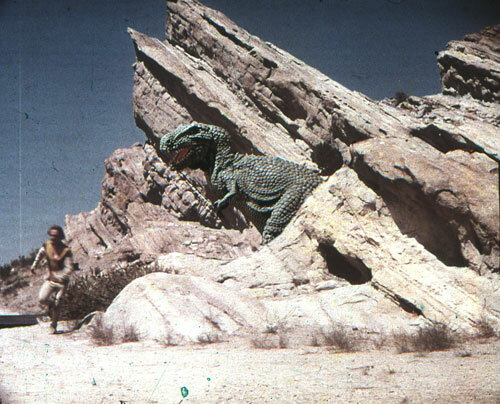 The strongest connection to the original movie seemed to be the re-use of both miniatures and actual effects shots. This artwork is from the cover of one of a pair of graphic novel adaptations, published in France by Dargaud in 1979 and 1980, written and illustrated by Pierre Frisano. Thanks to August Ragone for the info!